Founder of the Brand - "Foreign Exchange Maverick Thinkers"
Founded own Brand " Foreign Exchange Maverick Thinkers (FEMT) " during 2005. The purpose of the brand is to educate people from different parts of the Globe covering variety of topics.Our objective is to cover practical aspects of the concepts to be supported by live Financial Terminals, Meta Traders (MT4), Meta Trader (MT5) and respective Software's. Presence of Treasury Consulting LLP Brand – " Foreign Exchange Maverick Thinkers (FEMT) "
LinkedIn & LinkedIn Academies :: Sitting today Treasury Consulting LLP is having LinkedIn Networking of over 100 Million across the Globe. Our networking covers Corporate Treasurers, Chief Financial Officers (CFO), Chief Executive Officers (CEO), International Bankers, G7 Banks, Corporate Finance Professionals, Finance Controllers, Board Members, Information Technology (IT) Experts, PHD’s, Management Graduates and respective. 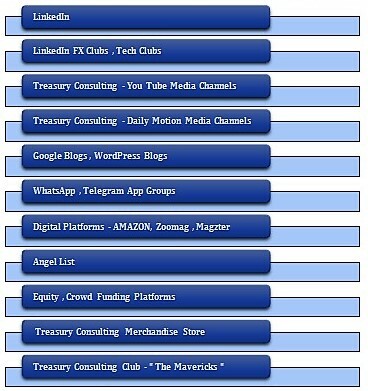 The following are LinkedIn Groups being maintained by Treasury Consulting LLP having over 4000 members. You Tube Channel :: Treasury Consulting LLP You Tube channel - " Foreign Exchange Maverick Thinkers " covers over 500 Technical Videos ( Expected 800 Technical Videos by Dec'18, 1200 by Dec'19) covering International Accounting Standards ( IFRS, US GAAP, IND-AS), Basel III, Business Valuation, Credit Risk Management, Contract Life Cycle Management (CLCM), Costing - Operational Analytics, Treasury Management Systems (TMS), Derivatives Strategies, Foreign Exchange Risk Management, Fixed Income Markets, Financial Models, Frauds, Forensics, Analytics, Investment Banking, Insolvency & Bankruptcy Code (IBC) 2016, Law, Companies Act 2013, MiFID II, Private Placement Platforms (PPP), Risk Management, Swaps, Forward Rate Agreements (FRA), Interest Rate Derivatives (IRS), Treasury Regulatory, Technical Analysis, Virtual CFO Services and respective videos. You Tube Playlists :: The following are the playlists maintained by our You Tube Channel covering 500 Technical Videos. Daily Motion Channel / Metacafe Channel :: On the verge of our You Tube Channel we are developing another 2 Channels which would be on Daily Motion, Metacafe. Both the Channels would be covering all 500 Videos. Technical Content of both Daily Motion, Meta Café Channels remains as original as we have of our You Tube Channel. WhatsApp Professional Groups :: Treasury Consulting LLP managing over 44 Professionals Groups on WhatsApp whereby we are managing more than 20 K Professional members covering respective topic. Extensive list of Groups is well available in our Monthly Newsletter. Telegram Professional Groups :: On the verge of our WhatsApp Professional Groups having several Professional Groups on Telegram App whereby we are managing more than 2500 Professional members across the Globe covering variety of topics. Treasury Consulting LLP do owns dedicated Telegram Channel covering Videos, E Books and several technical Stuff. Foreign Exchange Academies – Skype Platform :: Treasury Consulting LLP is having dedicated Foreign Exchange Academies on Skype whereby connected with several hundred Professional members and covering almost all aspects of Foreign Exchange Markets. Using Skype App we do provide Webinars as well covering members placed in International Markets. Foreign Exchange Academies – Twitter Platform :: Treasury Consulting LLP is having dedicated Foreign Exchange Academies on Twitter whereby connected with several hundred Professional members and covering almost all aspects of Foreign Exchange Markets. Using Skype App we do provide Webinars as well covering members placed in International Markets. Google Groups ~ ” Foreign Exchange Maverick Thinkers " :: Treasury Consulting LLP do havehis own Google Group which is further attached with Digital Library full ofForeign Author Books, Financial Modelling Excel based Models, Cash Flow Modelling Models, Risk based Models, Accounting Guides, RBI Master Circulars, CFA Books and respective others. Well as of now Google Group is having more than 5000 members spreading across the Globe. Google Blog "Maverick TreasurersBlog :: Launchedour own Blog on Google where by the purpose is to link with members across the Globe. As of now Google Group is covering all the topics from Foreign Exchange till Business Valuation. Group is open to all the members across the Globe. AMAZON, Joomag & Magzter :: Treasury Consulting LLP is having dedicated presence on biggest Digital Platforms like AMAZON, Magzter and Joomag whereby selling his flagship Magazine – "The Maverick Treasurer”. Our upcoming Magazine titled – "The Fraudster” would be available on same Digital Platforms. During Year 2017 we would be launching Paperback versions of both Magazines as well which would be available in Physical shape. 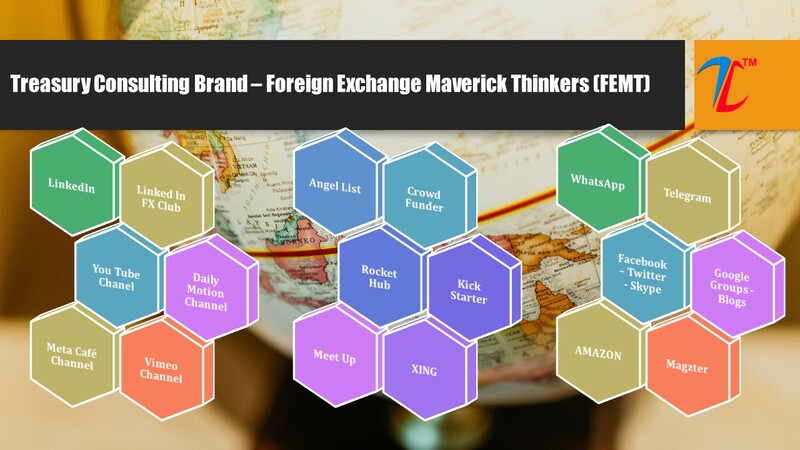 Angel List / Crowdfunding Sites :: Treasury Consulting LLP, Our Brand- "Foreign Exchange Maverick Thinkers "is having dedicated presence on Crowdfunding, Equity Funding sites like Angel List, Rocket Hub, Crowd Funder and Kick Starter. Over the period we would be adding more such platforms for our self, Treasury Consulting LLP and our Brand. Treasury Consulting Pte Ltd Brand - " Foreign Exchange Maverick Thinkers (FEMT) " is well connected with Iveleague Platforms like LinkedIn, LinkedIn Academies, You Tube Channel (2nd Largest You Tube Channel), Daily Motion Channel, Meta Cafe Channel, WhatsApp Group ( 44 WhatsApp Groups ), Telegram Channels, Foreign Exchange Academies on Skype, Twitter, Google Groups - " Foreign Exchange Maverick Thinkers ", Google Blog, Media Publications Platform like AMAZON, Joomag, Magzter, Angel List and Crowd funding sites. You are most welcome to join our Brand - " Foreign Exchange Maverick Thinkers (FEMT) " where by we are serving millions of members on daily basis.